Author Affiliations: Institute for Complementary and Alternative Medicine, University of Medicine and Dentistry of New Jersey, Newark (Dr Perlman); Yale Prevention Research Center, Yale University School of Medicine, Derby, Conn (Drs Sabina, Njike, and Katz and Ms Williams). Arch Intern Med. 2006;166(22):2533-2538. doi:10.1001/archinte.166.22.2533. Background Massage therapy is an attractive treatment option for osteoarthritis (OA), but its efficacy is uncertain. 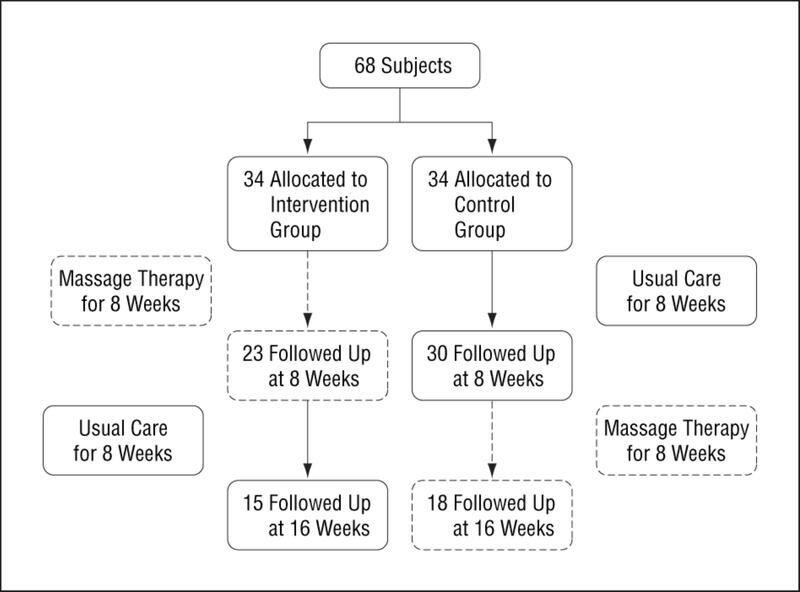 We conducted a randomized, controlled trial of massage therapy for OA of the knee. Methods Sixty-eight adults with radiographically confirmed OA of the knee were assigned either to treatment (twice-weekly sessions of standard Swedish massage in weeks 1-4 and once-weekly sessions in weeks 5-8) or to control (delayed intervention). 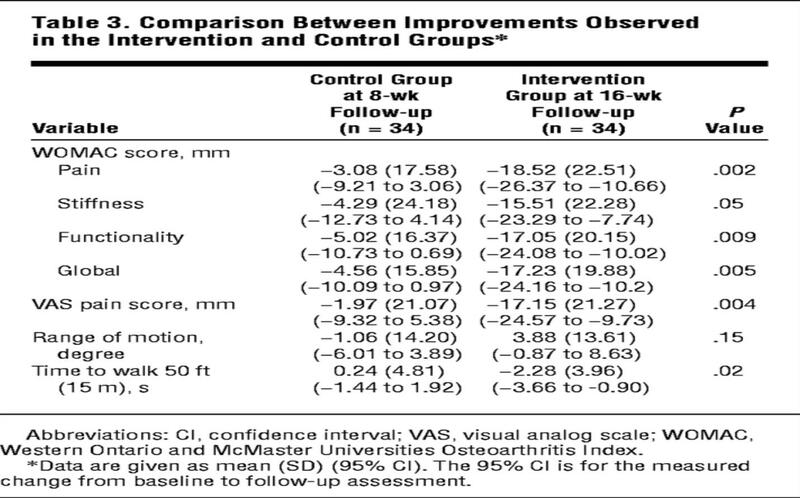 Primary outcomes were changes in the Western Ontario and McMaster Universities Osteoarthritis Index (WOMAC) pain and functional scores and the visual analog scale of pain assessment. The sample provided 80% statistical power to detect a 20-point difference between groups in the change from baseline on the WOMAC and visual analog scale, with a 2-tailed α of .05. Results The group receiving massage therapy demonstrated significant improvements in the mean (SD) WOMAC global scores (−17.44 [23.61] mm; P<.001), pain (−18.36 [23.28]; P<.001), stiffness (−16.63 [28.82] mm; P<.001), and physical function domains (−17.27 [24.36] mm; P <.001) and in the visual analog scale of pain assessment (−19.38 [28.16] mm; P<.001), range of motion in degrees (3.57 [13.61]; P = .03), and time to walk 50 ft (15 m) in seconds (−1.77 [2.73]; P<.01). Findings were unchanged in multivariable models controlling for demographic factors. Conclusions Massage therapy seems to be efficacious in the treatment of OA of the knee. Further study of cost effectiveness and duration of treatment effect is clearly warranted. Osteoarthritis of the hip or knee is particularly disabling because it limits ambulation, but the affliction also strikes the hands, the spine, and the feet with the same destructive joint process.5,8 The end point of the OA disease process is total loss of joint cartilage in the affected area and the need for joint replacement. Massage therapy may diminish symptoms and improve the course of OA by increasing local circulation to the affected joint, improving the tone of supportive musculature, enhancing joint flexibility, and relieving pain.14 Massage therapy has been evaluated and found to be effective for various painful musculoskeletal conditions.15,16 However, to our knowledge, to date, no study has specifically evaluated the effectiveness of massage therapy for OA. We performed a randomized, wait-list controlled trial of 8 weeks’ duration of Swedish massage therapy for OA of the knee. Patients were recruited from January to July of 2003 from the Saint Barnabas Health Care System (the Carol and Morton Siegler Center for Integrative Medicine and the Arthritis and Rheumatic Diseases Center), Livingston, NJ. The intervention was developed in conjunction with Yale Prevention Research Center (Derby, Conn) and conducted at the Siegler Center, located in the Saint Barnabas Ambulatory Care Center in Livingston. Eligible patients were men and women with radiographically established OA of the knee who met American College of Rheumatology criteria,17 were at least 35 years of age, and had a prerandomization score of 40 to 90 on the Western Ontario and McMaster Universities Osteoarthritis Index (WOMAC) and visual analog scale (VAS) pain assessment scale (0 mm indicates no pain; 100 mm, worst pain ever).18 Written confirmation of OA of the knee was provided by the patient’s physician. Patients with bilateral knee involvement had the more severely affected knee designated as the study knee. Exclusion criteria were the presence of rheumatoid arthritis; fibromyalgia; recurrent or active pseudogout, cancer, or other serious medical conditions; signs or history of kidney or liver failure; asthma requiring use of corticosteroids; use of oral corticosteroids within the past 4 weeks, intra-articular knee depocorticosteroids within the previous 3 months, or intra-articular hyaluronate within the previous 6 months; arthroscopy of the knee within the previous year; significant injury to the knee within the previous 6 months; or a rash or open wound over the knee. Participant recruitment involved informational letters to patients with OA at the Arthritis and Rheumatic Diseases Center at Saint Barnabas Ambulatory Care Center and institutional review board–approved fliers distributed at the Saint Barnabas Ambulatory Care Center and nearby senior living facilities and to practicing primary care physicians in the area. Volunteers were screened for eligibility over the telephone. A research coordinator randomly assigned enrolled participants to receive either 8 weeks of massage therapy intervention (hereafter, the intervention group) or 8 weeks of usual care on a wait-list (hereafter, the control group) followed by the intervention using a computer-generated, blocked (blocks of 6) random allocation sequence. The control group continued with their usual care before starting the intervention. Each patient provided written informed consent prior to enrollment. The institutional review boards of the Saint Barnabas Medical Center; the University of Medicine and Dentistry of New Jersey, Newark; Griffin Hospital, Derby; and the Human Investigation Committee of Yale University, New Haven, Conn, approved the study. Two licensed massage therapists certified by the National Certification Board for Therapeutic Massage and Bodywork provided the massage therapy. The therapists used a standard Swedish full-body therapeutic massage technique20 and a standard protocol for the study intervention, which included pétrissage (compression or manipulation of soft tissue between the fingers and thumb), effleurage (gliding of hands over the skin or soft tissues), and tapotement (percussion-based massage where hands strike soft tissue in a repetitive, rhythmic fashion) techniques used at the therapists’ discretion.21,22 Massage sessions were 1-hour long. Usual care included pain medications, exercises, or hot and cold therapy. Initial (weeks 1-4) treatments were given with greater frequency (twice weekly) to build a loading dose of massage treatments, followed by once-weekly massage sessions for weeks 5 through 8. Participants remained supine or prone for the full hour of treatment, turning over at roughly the halfway point. To minimize practitioner variability of treatment, a standard protocol incorporating specific strokes (effleurage, pétrissage, or tapotement) was used; however, a particular sequence of strokes was not specified. Study personnel met with the massage therapists at regular intervals to assure compliance with the protocol. The control group continued to receive conventional medical care during the initial intervention period, then crossed over to receive massage (weeks 9-16) after an initial 8-week delay. Study personnel prompted subjects for all scheduled appointments to minimize attrition. All measurements were collected at baseline and after completion of intervention (at weeks 8 and 16) in both groups. Demographic data and medical history were documented by the research coordinator. Participants were instructed to keep a daily medication usage diary. The WOMAC is a self-administered 3-dimensional questionnaire that assesses pain, stiffness, and physical functional disability in patients with knee and hip OA using a series of 24 questions.18 A negative change in WOMAC scores from baseline indicates improvement of symptoms and limitation whereas a positive change indicates deterioration of symptoms and limitation. All 24 WOMAC items are rated on a numerical rating scale (in millimeters) ranging from 0 (no symptoms/no limitation) to 100 (maximal symptoms/maximal limitation).23 The WOMAC scores were standardized by calculating the mean of the corresponding unweighted item scores in each dimension.24 The WOMAC global score was computed as the unweighted mean of all 24 items. Additional outcome measures assessed at each visit included the VAS for pain assessment, which is a 100-mm-long visual scale on which the participant draws a line to designate their level of pain at interview; time in seconds to walk a 50-ft (15-m) straight path; range of motion in degrees using a standard goniometric assessment as performed by a trained research assistant at the center; and adverse events (complaint, system, and severity) were recorded by the research coordinator during her routine weekly telephone call to each participant. Descriptive statistics for each relevant variable at baseline were determined to justify parametric methods. Continuous data are presented as mean (SD) in the text and tables. The paired t test was used to examine the change in scores from baseline to follow-up examination. Changes in WOMAC and VAS scores, time to walk 50 ft (15 m), and the clinical assessment for range of motion between the treatment groups were measured using repeated measures analysis of variance. The 95% confidence intervals were determined for changes from baseline. 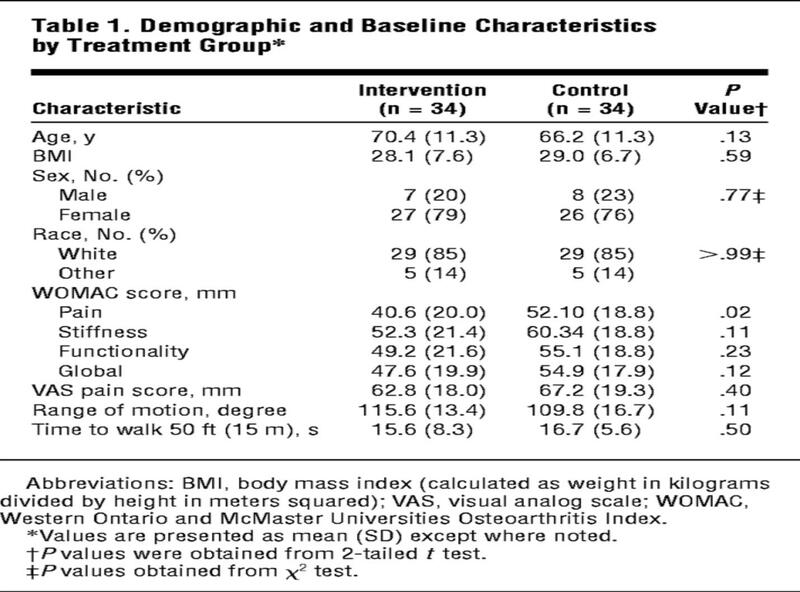 The combined effect of independent variables (demographics, body mass index, baseline WOMAC and VAS scores, and investigators’ baseline assessment for range of motion) and treatment assignment on WOMAC and VAS scores, time to walk 50 ft (15 m), and the clinical assessment for range of motion was assessed with multivariable models using analysis of variance. The WOMAC findings were validated with the VAS findings and the clinical assessment for range of motion using correlation coefficients. Analysis followed an intention to treat design (ie, the last value carried forward). Data were analyzed using SAS statistical software (version 8.2; SAS Institute, Cary, NC). Significance for the 2-tailed t test was set at P<.05. Of 210 candidates screened, 68 subjects participated (34 subjects per group) (Figure). Approximately 82 (39%) of those screened were ineligible, and 60 (28%) were unable to complete screening or were uninterested. 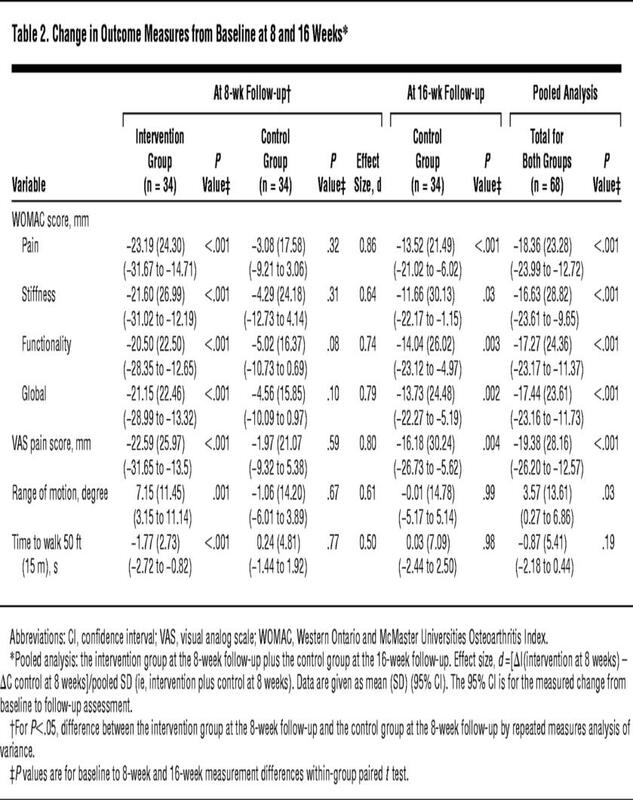 The study groups were comparable at baseline (Table 1); however, the mean (SD) WOMAC pain score was higher (P = .02) in the intervention group (52.10 [18.82] mm) vs the control group (40.69 [20.01] mm) at baseline. The stiffness, functionality, global, VAS, and range of motion scores at baseline did not differ between groups. The mean (SD) WOMAC global score improved significantly from baseline value (−21.15 [22.46] mm; P<.001), as did the score in each domain (pain, stiffness, and physical functional disability) (Table 2). The greatest improvement from baseline in the intervention group was observed in pain (−23.19 [24.30] mm; P<.001) followed by stiffness (−21.60 [26.99] mm; P<.001) and physical function (−20.50 [22.50] mm; P<.001). No significant change was observed in the control group from baseline in any of the domains. Improvements observed in the intervention group differed significantly from the control group (pain: −23.19 [24.30] mm vs −3.08 [17.58] mm, P<.001; stiffness: −21.60 [26.99] mm vs −4.29 [24.18] mm, P = .007; physical functional disability: −20.50 [22.50] mm vs −0.02 [16.37] mm, P = .002; and global score: −21.15 [22.46] mm vs −4.56 [15.85] mm, P<.001). A similar pattern was observed in the VAS and the clinical assessment for range of motion. The change observed in VAS was highly correlated to the change in the WOMAC global score (r = 0.84; P<.001). Findings persisted after controlling for demographic and baseline clinical values. The control group in this trial received the intervention after an initial delay of 8 weeks and thus became a second intervention group during weeks 9 to 16 (Figure). Within-group intervention effects for the entire, pooled study sample are thus available and are shown in Table 2. The mean (SD) WOMAC global scores improved significantly from baseline (−17.44 [23.61] mm; P<.001). Significant improvement was observed in all domains (pain: −18.36 [23.28] mm, P<.001; stiffness: −16.63 [28.82] mm, P<.001; and physical functional disability: −17.27 [24.36] mm, P<.001) of the WOMAC score. The VAS and range of motion scores also improved significantly from baseline (−19.38 [28.16] mm, P<.001; and 3.57 [13.61], P = .03, respectively). At the 16-week assessment, improvements seen in the intervention group (massage intervention ceased at 8 weeks) largely persisted (Table 3). Comparing the improvements observed in the intervention group at week 16 (ie, 8 weeks after the intervention was completed) with the control group at week 8 (ie, at the end of their nonintervention period) revealed significant, residual mean (SD) differences in pain (−18.52 [22.51] mm vs −3.08 [17.58] mm; P = .002), function (−17.05 [20.15] vs −5.02 [16.37]; P = .009), WOMAC global score (−17.23 [19.88] mm vs −4.56 [15.85] mm; P<.005), VAS score (−17.15 [21.27] mm vs −1.97 [21.07] mm; P = .004), and time to walk 50 ft (15 m) (−2.28 [3.96] seconds vs 0.24 [4.81] seconds; P = .02). Subjects were instructed to report adverse events to the massage therapist; 1 reported increased discomfort and refused to return for the 8-week assessment. This study suggests that massage therapy using the Swedish technique is safe and effective for reducing pain and improving function in patients with symptomatic OA of the knee. To our knowledge, this is the first prospective, randomized trial assessing the efficacy of massage for OA. Massage has previously shown promise for other musculoskeletal conditions such as rheumatoid arthritis and fibromyalgia.25– 27 Our results are concordant with these prior findings. In this study, the magnitude of the treatment effects (ie, effect size) at the 8-week assessment in the WOMAC scale were large, ranging from 0.64 to 0.86 (Table 2). These effects are greater than those observed by Witt et al28 in a large acupuncture trial of similar design. Using intention-to-treat analysis and carrying forward baseline values likely biased our results toward the null. The treatment effects observed were stronger when limited to only those subjects returning for follow-up. Thus, our findings are a conservative estimate of the magnitude of treatment effect. Losses to follow-up, shown in the Figure, are reflective of the real-world experience with an elderly population with impaired mobility. We used a wait-list control design because no validated method of performing “placebo massage” has been developed. This did result in increased contact with study personnel for the intervention group during the 8-week intervention. Although Hawthorne effect29,30 may have been a factor in our results, both intragroup and intergroup differences were significant at 8 weeks, and the improvements in the intervention group largely persisted at the 16-week follow-up, which was 8 weeks after the subjects finished the weekly massage sessions. We used Swedish massage because it is one of the more common and readily accessible or practiced techniques in the United States.22 There was limited precedent for selecting frequency, duration, or even type of massage. There may prove to be more—and less—effective approaches, and this will need to be elucidated in subsequent studies. There are also nonconventional and nutriceutical treatments for OA. Trials regarding the efficacy of glucosamine with or without chondroitin are inconclusive. However, a recent randomized controlled clinical trial (the Glucosamine/chondroitin Arthritis Intervention Trial39) suggested that the combination is effective for patients with moderate to severe OA pain. Other nutriceutical treatments, including devil’s claw and ginger,35 have yet to be proven effective. Recent research has suggested that acupuncture may also be an effective option for patients with OA.40 Establishing massage as a therapy for OA would provide an additional option to the current approaches. The study duration was only 16 weeks; OA is a chronic condition, and therefore longer studies will be needed. Losses to follow-up were noteworthy. However, an intention-to-treat analysis was used, and therefore our findings may be conservative estimates of treatment effect. Because participants did not keep accurate medication diaries, we cannot reliably know if change in medications in any way affected our results. It seems unlikely that the massage intervention would have caused participants to increase their medication in such a way as to lead to significant improvement in pain and function compared with the control group. Bias toward a null effect is more probable. In conclusion, this pilot study suggests that massage therapy is efficacious in the treatment of OA of the knee, with beneficial effects persisting for weeks following treatment cessation. Massage therapy seems to be well tolerated by people with painful OA of the knee. Massage also seems to decrease pain and improve function in participants who were allowed to maintain their usual treatment. Given the limitations and potential adverse effects of pharmacologic and nonpharmacologic treatments for OA, massage therapy seems to be a viable option as an adjunct to more conventional treatment modalities. Further study of massage to determine optimal treatment protocols, absolute efficacy, cost-effectiveness, and generalization to other patient groups is clearly warranted. Correspondence: Adam I. Perlman, MD, MPH, University of Medicine and Dentistry, School of Health Related Profession, Institute for Complementary and Alternative Medicine, 65 Bergen St, Stanley S. Bergen Bldg, No. 101, Newark, NJ 07107-1709 (a.perlman@umdnj.edu). Accepted for Publication: September 1, 2006. Author Contributions:Study concept and design: Perlman, Sabina, Williams, and Katz. Acquisition of data: Perlman. Analysis and interpretation of data: Perlman and Njike. Drafting of the manuscript: Perlman, Sabina, and Williams. Critical revision of the manuscript for important intellectual content: Perlman, Sabina, Williams, Njike, and Katz. Statistical analysis: Njike. Obtained funding: Perlman and Williams. Administrative, technical, and material support: Perlman, Sabina, and Williams. Study supervision: Perlman and Katz. Funding/Support: This study was supported by the Centers for Disease Control and Prevention (grant SIP-14-00) and Prevention Research Center core grant U48-CCU115802. Acknowledgment: We thank Michael Yablonski, NCTMB, massage therapist, Linda Winz, NCTMB, massage therapist, and Marie K. Saimbert, MLIS, Elena Mojica, MPH, and David Hom, MS, for their contributions. Felson, D.T. ; Lawrence, R.C. ; Hochberg, M.C. ; et al. Osteoarthritis: new insights, II: treatment approaches. Ann Intern Med 2000; 133 726-737.